This article explains how you can repair corrupted MBR when the damage occur. There are many ways: traditional way and new way - with AOMEI Partition Assistant and its function: rebuild MBR. MBR, short for Master Boot Record. It will be created when you create the first partition on the hard drive. It is very important data structure on the disk. The MBR contains the Partition Table for the disk and a small amount of executable code for the boot start. The location is always the first sector on the disk. Without a valid MBR, it’s impossible to boot the system from the hard disk. If the MBR has something wrong, it may prevent the system from booting. The MBR may be affected by malicious code, become corrupted by disk errors, or be overwritten by other boot loaders when experimenting with multiple operating systems on a host. Viruses and programs gone haywire damage MBR usually. If all of a sudden your computer does not boot and you see error information such as "operating system not found", "missing operating system" or "invalid partition table", you know there is something really wrong with the MBR. What cause corrupted MBR? Maybe your partition infected by trojan horse virus and your anti-virus program didn't remove it completely. Or maybe you loaded a backup image for one of the operating systems and this ended up slightly messing up the MBR. Some external hard disk may also encounter corrupted MBR. How to Fix Corrupted MBR? How to repair corrupted MBR due to a virus or some kind of damage? When you reach the command prompt, type "fixmbr" and then press Enter. The fixmbr utility will write a master boot record to the hard drive that you're currently using to boot into Windows XP. This will repair any corruption or damage that the master boot record may have. Take out the Windows XP CD, type “exit” and then press Enter to restart your PC. Assuming that a corrupt master boot record was your only issue, Windows XP should now start normally. Using Windows Recovery Console to repair corrupted MBR is a traditional way. Recovery is entirely possible if you can access the Recovery Console and you know which command to type for your version of Windows. Another situation, after the damage has occurred, the system was unbootable. The system would try to boot to a nonexistent copy of System Commander. Unfortunately, it was impossible to reinstall System Commander, because the system was unavailable. Now you need to employ AOMEI Partition Assistant Bootable USB or CD to resolve boot problem which has the same operation with AOMEI Partition Assistant. Next please see the following step-by-step instructions to fix corrupted MBR with its function - "Rebuild MBR". Connect the damaged computer’s hard drive to another PC as slave. 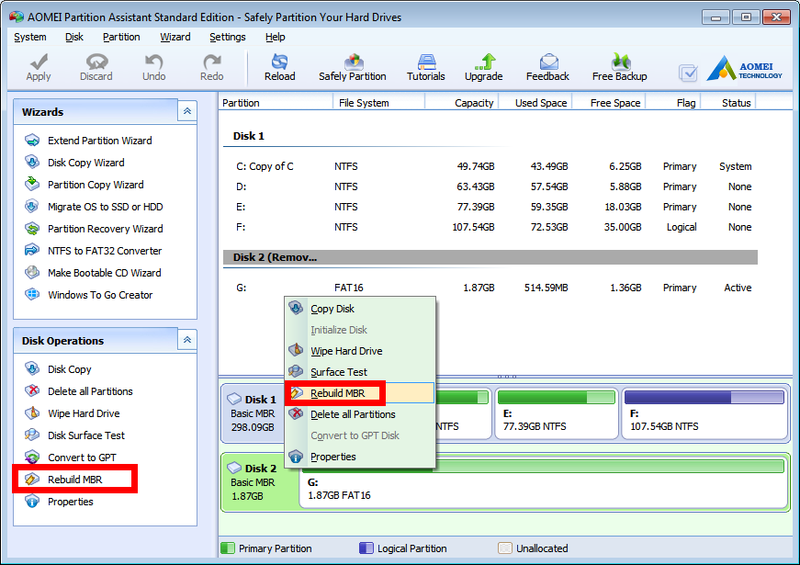 Download AOMEI Partition Assistant Standard Edition in health PC, install and run. At last, click "Apply" button to execute pending operation. Connect the fixed hard drive to original computer and boot from it when fixing MBR has completed. Nowadays, many disks are GPT style, compare to MBR, GPT has many advantages, the most important one is that it supports partition larger than 2TB. If you want to try GPT, you can also use AOMEI PArtition Assistant with its function - "Convert MBR to GPT disk".